Everyone needs a website. And whether it's for a blog, store, or web presence, WordPress is arguably the best platform to use. 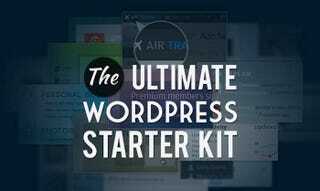 So for a limited time, Lifehacker readers can get 84% off the Ultimate WordPress Kit. It includes premium themes and plugins to build or enhance any the functionality and look of any WordPress site. Online Business: MarketPress is the a famously simple, powerful shopping cart plugin available exclusively to WPMU DEV members. SEO: Expert SEO integration, social media, analytics, and support. Marketing: Social, content, email and on site marketing with expert help. Publishing: Paid content, social integration, advertising, wikis, comments, and more. Community: Chat, forums, voting, directories, live streams, events and more. Exclusive access to hundreds of customizable, mobile-responsive WordPress themes. In addition to the themes and plugins, WPMU DEV's starter kit includes 24/7 help & support from their team of WordPress Experts. This is one of the cooler features – no more scouring forums for help building a website.